According to mciu.org, the Reading Olympics is a competition where student teams are given forty to fifty books that have been carefully selected by a committee of librarians, reading specialists and classroom teachers to read. The student teams then compete to correctly answer questions related to the selected books. Generally, the Reading Olympics is regarded as a celebration rather than a contest. Its objectives are to promote independent reading among the younger generation and to foster within them a greater love and appreciation towards the commendable activity. 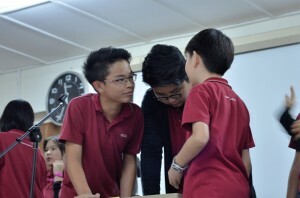 Earlier this year; R.E.A.L International School, Shah Alam Campus organized its very own Reading Olympics with the purpose of cultivating the habit amongst students and encouraging them to read more. The event also aims to make reading an exciting and enjoyable hobby to pursue. This year saw a total of 38 students from Year 4 & 5 (Primary section) and Year 7 & 8 (Secondary section) participating. Participants were divided into two groups per level. Three judges, a recorder and question readers were also assigned to facilitate the competition. In the end, the results were tabulated and students from Year 4H, 5A, 7B and 8V came out trumps in their respective levels. Much like the burning torch of real Olympic fame, the Reading Olympics proved successful in fanning the flames of interest amongst students to not only read more, but to read a variety of books and other literary materials. In this modern age and digital era that we are living in, the time-honoured tradition of reading books is in real danger of diminishing. Slowly but surely, libraries are becoming redundant relics of the past while the Internet is seemingly growing in influence by the day. Lest we forget, reading books is still an essential tool for active, lifelong learning. How so? For one thing, not every book can be found online. Books still hold a treasure trove of information and continue to serve as valuable sources of knowledge. R.E.A.L Schools and the Reading Olympics in particular, are steadfast in conserving the culture of reading, especially amongst the youth in order to preserve this proud practice for generations to come. If knowledge is power, then a society of readers is a reflection of its status or standing in today’s world. The post Rewarding REAL Readers appeared first on best international schools in malaysia.